Medjugorje is a small village in western Herzegovina inhabited by Croatian Catholics. On 24 June 1981, about six o'clock in the afternoon a Blessed Virgin Mary appeared to six young people - Ivanka Ivanković, Mirjana Dragičević, Vicka Ivanković, Ivan Dragičević, Ivan Ivanković and Milka Pavlović - at Podbrdo, on the slopes of Mt. Crnica. This location is known as "Apparition Hill" or a place where Mary has promised to leave a permanent sign once the apparitions have ceased. 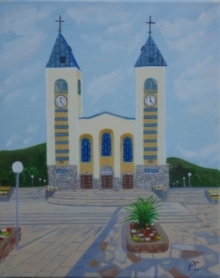 Since then, Medjugorje has become the best known and most visited place in South-East Europe. Millions of pilgrims from all over the world visit Medjugorje every year to find peace and hope in the messages from Our Lady, the Queen of Peace. Each day at St. James Church, several Masses (in different languages) are celebrated and thousands of people attend. In the evening, the church is jammed with pilgrims who come to pray the Rosary (Joyful and Sorrowful Mysteries before Mass, Glorious Mysteries after Mass), and to receive the Sacrament of Reconciliation. Many remain for a healing service. It is during the evening Rosary that the apparitions take place in the choir of St. James Church. Medjugorje is one of the most powerful prayer centers in the world today. Our Lady is still appearing on regular basis to four of three visionaries. Regular apparitions stopped for Mirjana Dragičević on 25 December 1982 when Our Lady confided the tenth and last secret to her and promised that she would appear to her on her birthdays and special occasions. Ivanka Dragičević had her last vision of Our Lady on 7 May 1985. In the meantime two new locutionares have claimed to be getting messages from Our Lady - Jelena Vasilj since 15 December 1982 and Mirjana Vasilj since 1 April 1983. Number of pilgrims who visit Medjugorje and famous "Apparition Hill" is growing every year. Today Medjugorje is one of the most powerful prayer centers in the world.